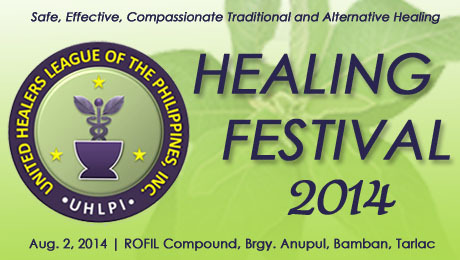 BAMBAN, Tarlac-The United Healer’s League of the Philippines, Inc. (UHLPI) invites everyone who wishes to experience traditional and alternative healing to its event, “Healing Festival 2014,” which will be held on August 2, 2014 at ROFIL Compound, Brgy. Anupul, Bamban, Tarlac. This Healing Festival is a project initiated by the UHLPI’s Council for Kuranderos, with the cooperation of UHLPI’s Council for Hilot. Event partners are the Union Espiritista Cristiana de Filipinas, Inc. (UECFI) [Regions 7, 7A, 17 and 17A] and the Association of Traditional Health Aid Givers Philippines, Inc. (ATHAG). The Healing Festival 2014 is being conducted in support of the government’s universal health care initiatives and in line with Republic Act 8423, or the Traditional and Alternative Medicine Act of 1997, which aims to promote and make available on a wider scale safe, effective, non-invasive and compassionate traditional and alternative healing modalities. This Festival aims to serve the communities of Pampanga, Tarlac, Zambales and Bataan, and other people in need of healing. Registration of patients will begin at 7:00 a.m., and end at 12:00 noon. Interested participants are invited to come early in order to be accommodated. The Healing Festival itself will commence at 8:00 a.m. and end at 5:00 p.m.